If you or a loved one has been injured on an amusement park ride, the amusement park may owe you compensation for your damages. However, the nature of the accident that caused your injuries may dictate the type of personal injury claim you can file, and therefore determine the amount and type of damages you are entitled to. At The Pendas Law Firm, we assist individuals with the filing of personal injury claims every day. If you believe that the amusement park at which the accident occurred is responsible for your injuries, we can help you file one of two types of personal injury claims: Negligence or product liability. If your accident was the result of carelessness or inattention by an employee of the amusement park, you most likely have a claim of negligence. For instance, if you were on a ride and the attendant failed to check your safety strap, and you were severely injured as a result, your injuries would be the result of negligence. In a standard negligence claim, you must prove that the law demanded a certain level of care or precaution to be taken by the employee, that the employee failed to act with the expected level of care and precaution, and that their failure to do so led to your injuries. If you can prove each of those elements to be true, you stand a good chance of collecting damages. However, even if an employee were responsible for your injuries, the amusement park would be held liable. This is because an establishment is always responsible for its employees and their actions. So even if a park has strict safety protocol in place, if a single employee fails to abide by that protocol and an injury occurs as a result, the park will be held responsible. In some cases, a person’s injuries may have nothing to do with an employee’s inattention or carelessness. Sometimes, a ride or piece of equipment may be damaged or defective. If your injuries were the result of a defective ride or component of a ride, and not by improper maintenance, inspection, operation, or use, several parties may be held liable under a product liability claim. 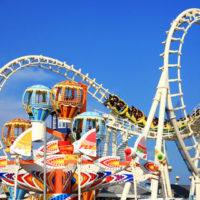 For example, if the accident in which you were injured was caused by a faulty latch on a safety restraint on one of the rides, the amusement park may be held liable for not double checking its equipment prior to allowing patrons onto the attraction. The manufacturer of the faulty part may be held liable simply for creating a faulty part, as might the manufacturer of the ride, for using faulty parts on the finished product. If you file a product liability claim, you must prove that the structure or a part was defective, and that the defect specifically caused your injury. As the home to some of America’s favorite amusement parks, Orlando has seen its fair share of amusement park accident claims. Though parks such as Walt Disney World Resort and Universal Orlando Resort take extreme precautions to protect the safety of their patrons, accidents do happen. When they do, it is important for victims to understand that they have rights. If you were injured in an amusement park accident at one of Orlando’s leading attractions, you deserve to be compensated for your injuries. At The Pendas Law Firm, our Orlando personal injury lawyers are prepared to negotiate on your behalf for the compensation you need and deserve. If necessary, we are even willing to go to trial to prove that the amusement park is in fact liable for your injuries. To consult with a personal injury lawyer today regarding your accident, call 1-888-LPENDAS. The Pendas Law Firm also serves clients in the Jacksonville, Daytona, Tampa, Bradenton, Fort Myers, West Palm Beach, Fort Lauderdale, and Miami areas.